CF is a genetically inherited condition that affects the lungs and the digestive system. The gritty side of it is that I have a faulty gene which produces sticky mucus that clogs up the lungs and digestive system. I know it’s gross, but it is what it is. And there’s no cure. Yet. Living with CF ain’t no walk in the park, however easy you might make it look. Then we have the Nebulisers, inhalers and nasal sprays. The Nebs are done twice a day, preferably twelve hours between doses, alternating monthly between two different medications. They are also used to deliver mucus thinning agents to help ‘clear the airways’ in the form of DNase and Hypertonic Saline. And then there’s three inhalers, two nasal sprays and a partridge in a pear tree. It might sound a lot or it might sound very little, either way it’s my daily routine for now. So aside from all the crazy medication, my blood sugar level can drop quite quickly, which is known as Hypoglycaemia. This has developed over the last couple of years and can all depend on what I eat. I’m prone to getting low blood sugars in the mornings so it’s largely based on what I have for breakfast. The main culprits are cereals like Weetabix, Crunchy Nut Cornflakes, Co-Co Pops etc. which cause the blood sugars to drop quickly after 1-2 hours of eating them. How do I know when I’m having a hypo? I start feeling faint, then weak, then my hands start to shake and I’m covered in sweat. Not fun. Quite horrendous. One of the worst times happened when I was walking a dog and BAM the sugars dropped so fast that my vision went very bright, and I started seeing blotches of colour. I tell you now it ain’t easy to walk a dog when you’re feeling this way! Although at the moment my blood sugars are low, it’s likely that, at some point, I’ll get CF related Diabetes too. Because why not add another thing to the list eh! So that’s loosely the medical side of things. The physical side effects of living with CF is the coughing. 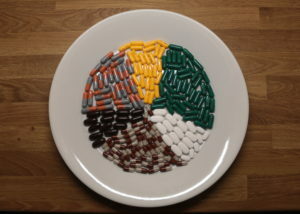 It is as much as a part of my daily routine as taking all the meds is. It happens every day without fail, almost like a subtle reminder of “yep, still got it!” Coughing is actually one of the things that has so much impact on my life…but that’s a subject for another day! Another physical side, are the stomach aches. Because my pancreas is rubbish at digesting nutrients/fat it needs a supplement of enzymes in the form of a tablet called creons. Meaning that with every meal, snack or drink (that contains fat) I consume, I need to take creons. Now if I take the exact amount then it’s not so much of a problem. Take too much or worse, not enough, then it’s a flipping nightmare! I’ve managed to fine tune my creon intake but there are still times when I’m wrong, or even worse, forget… the side effects of this mean that I can’t absorb all the fat, which means two things. One, the food will go right through me, hence the stomach aches and frequent bathroom trips, and two, I can’t absorb the calories/vitamins etc leading to weight loss, physical weakness, difficulty gaining weight etc etc. I am constantly reminded that weight plays a key role in living with CF. I’ve been to clinic before where doctors and dieticians congratulate me on gaining weight and other times where they look upon me with fear in their eyes on losing it…even if it’s intentionally! I guess I am one of the ‘lucky’ people in the CF world where gaining weight is as easy as saying ‘chocolate brownie’. The point is that it is VERY important to help clear the airways of mucus. Luckily for me, I am a dog walker, which I use as my physio excuse! It’s great exercise, plenty of fresh air, and providing I take the DNase one hour before I’m out walking, it works great. It gets the old heart rate up, and gets me out of breath! A win win situation! 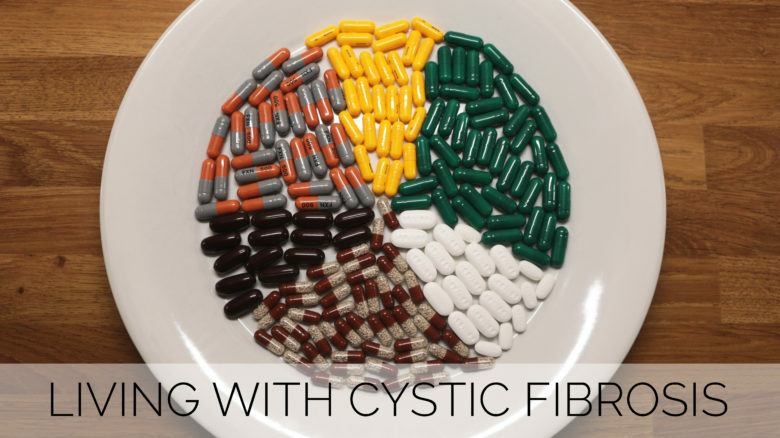 So what does it really mean to live with Cystic Fibrosis? It means getting into a daily routine (including physio *ahem*) it means alotta coughing and it means a helluva lot of pills and potions. But most of all it means dealing with anything that comes our way, and that my friend, means we are strong.